A 6.7 Magnitude Earthquake Struck Neiafu, Tonga. | Chaos Sweeps Away the World We Know! The Disaster, current events & Catastrophe Blog. Forecasts for 2014 to 2022. Read tomorrows news today! Plus current economic, commodities, stock indices and financial news. ← Pliny The Elder Predicts Earthquakes. A 6.7 Magnitude Earthquake Struck Neiafu, Tonga. 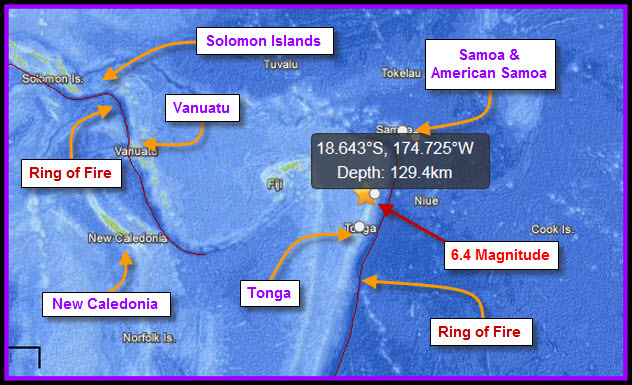 April 28, 2012 – A 6.7 Magnitude Quake Struck the South Pacific Near the Kingdom of Tonga: Today’s quake happened at 3:08Am near the epicenter, at a depth of 129 kilometers (80 miles). No tsunami watch or warning was issued by the Pacific Tsunami Warning Center (PTWC). Note: Thanks to one of my subscribers, this quake was upgraded by the USGS to 6.7 from 6.4. The tremor occurred 48 miles west of Neiagu, Tonga; 174 miles north of Nuku’alofa, Tonga; 384 miles SSW of Apia, Samoa; 397 miles southwest of Tafuna, American Samoa; and 401 miles southwest of Pago Pago, American Samoa. Tonga is pictured above. This entry was posted in Earthquake, The Kingdom of Tonga and tagged a 6.4 magnitude earthquake struck the south pacific island nation of the kingdom of Tonga april 28 2012, The Master of Disaster. Bookmark the permalink. 2 Responses to A 6.7 Magnitude Earthquake Struck Neiafu, Tonga. Thanks for the update Yamkin, I will change it.